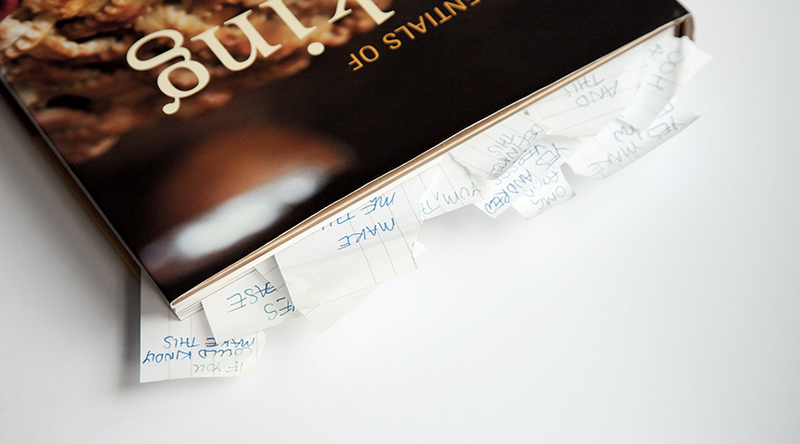 When photographer scamps Verity Roberts and Yen Chi Vo frantically rifled through a recipe book of mine whilst we met for our ‘Quick ‘n’ Easy Cook Club’, relentlessly bookmarking desserts that they demanded I make for them, I was a little overwhelmed. In my own time I took another look, and settled upon exploring the cheesecake. Like pizza, cheesecake had always occupied my mind with feelings of mystery, reluctance, and of course deliciousness, and was one of the first foods to instil what has now grown to be an obsession with the needing to know of how something is made (so that I can recreate it for myself at home). I combined the different recipes I read, made slight modifications, and if Verity’s reaction to last year’s birthday present was worth going by, the outcome was a success! As this recipe uses eggs, quantities of mixture can only be made in proportion to the nearest whole egg. This single-egg recipe will actually make a small dessert cheesecake that is enough for 2-3 people to share, rather than a single portion. However I normally triple the quantities, making a 3-egg cheesecake that provides around 8-10 slices, and the pictures in this recipe will show the larger version of the cheesecake. It will be good for a week in the fridge, keep it wrapped in Clingfilm. In my opinion, it tastes better as the week goes on; the final piece seems to be the best. I use tins with a removable base. For a small single-egg cheesecake, I use the small pie tins that I use for my single portion pies (future recipe). They allow the base to be pushed up to remove the pie. For a 3-egg cheesecake I use a tin with a releasable side. 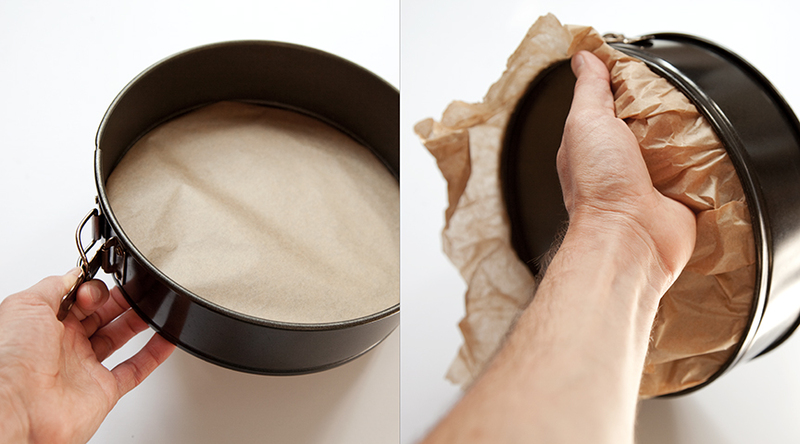 Use greaseproof paper / baking parchment if you want to transfer the cheesecake to a plate later. Tear a piece slightly bigger than the base and wrap over the top. Then place the base in to the tin, and fasten the sides. You can pull on the excess paper to tighten and flatten the parchment. Turn the oven on to 165 degrees. Put the butter in a pot, and place on a low heat. While the butter is melting, crush the biscuits in a pestle and mortar, or put them in a bag and smash them up. Stir them in to the melted butter until it has been absorbed evenly throughout the mixture, and spread over the base of the tin. 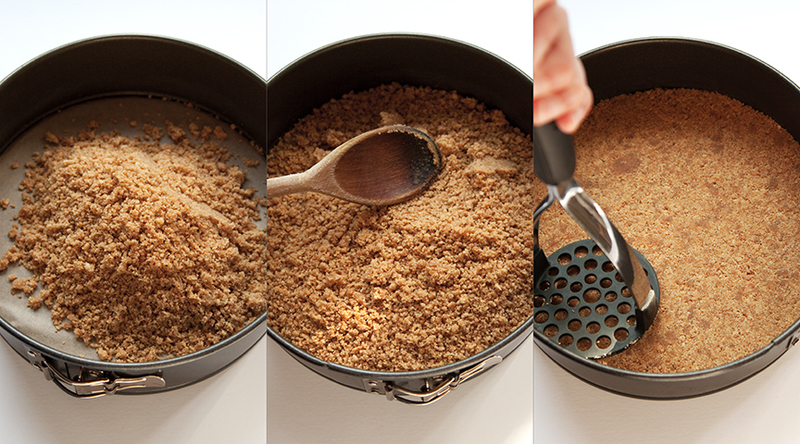 Use a masher to press the mixture down and pack it more firmly, then place in the oven for 8-10 minutes. Don’t overcook it! After you add each ingredient to the filling mixture, stir until blended. Blending the flour smoothly can be a bit challenging, so I add it before the more liquidy ingredients. You can also sieve it to help avoid lumps and add gradually while you stir, or alternate between adding some of the flour, then stirring. I use frozen berries if they’re going in the mixture, because they maintain their shape and stay in one piece when stirred in. After the tin has cooled, but before adding the mixture (obviously), you need to grease the sides of the tin. I always forget. When you finish a block of butter, fold up the packet and store it in the fridge. Whenever it comes to baking something, they are perfect to use for greasing. Just unfold and rub on the surface of the tin. You should cook the cheesecake until the centre no longer wobbles. You may still need to ease the edge away from the tin once cooked, carefully use a spatula for this. This basic baked cheesecake provides another good opportunity to experiment. So far I have tried it with blueberries (most commonly), raspberries, white chocolate, dried cherries, mango, amaretto, and lemon. You can also serve it with fresh fruit. 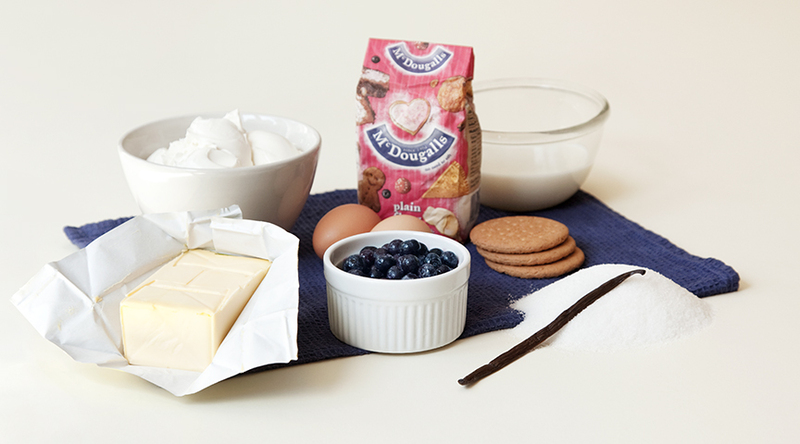 This entry was tagged Baked, Baking, Biscuit, Blueberry, Butter, Cake, Cheese, Cheese cake, Cheesecake, Cream, Cream cheese, Dessert, Digestive, Egg, Flour, Savoury, Sugar, Sweet, Vanilla. Bookmark the permalink. 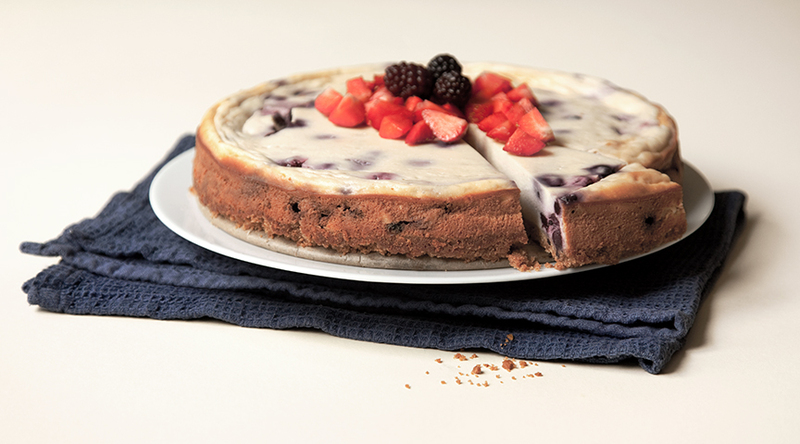 Great cheesecake recipe which I can’t wait to try and make myself! Very well explained and documented, in fact, I would have liked to see more images of the rest of the process in the same step-by-step kind of way, as I find that it works perfectly and it’s very clear. Also, I think that cake recipes serving up to 10 portions are the most commonly used ones, so maybe it would be better if the quantities were tripled already, and if they were all in grams:-)! It would be much easier for me hehe! Last thing, do I need to bake at 145° instead of 165° if using a fan oven? to have some uniformity to all the recipes on my blog. As the recipes build up, perhaps I’ll find I want to write groups of recipes in one way, and others in another. As far as grams or ounces, yes, perhaps I should show both. It’s not something I’d paid attention to before. I usually choose by which ever unit has a rounder number, maybe I should write the units of both grams and ounces in future. For the oven, my oven does have a fan, but it’s a bit unreliable so I would just try it out and see what happens!